Click on the links to jump to more info! The Kid’s Activities Area shuts down at 7 pm. For your first stop pick up a Passport and fill it up with stamps by stopping in at all the different activities, taking a trip around the Activity Area. Bring it back for a treat. Keep the book to remember the fun time you had at FEST 2018 and say a daily prayer from the back of the book. Let go…Let God! Put all your troubles into a fun squishy. Whenever you are stressed, it’s will be a great stress relief and a reminder that God will help you solve all your problems. Come back again and again and have some fun. Play a quick game in the Gaga Pits. The Boy Scouts are back with Human Fooseball and cool off in the Ice Cube Relay. Play on the inflatables. Play once, twice, or more! 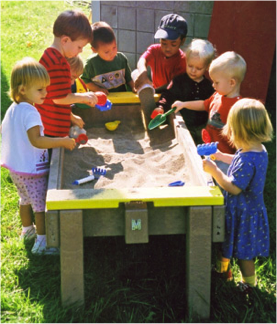 For the younger kids there will be plenty of Legos to play with and sand and water tables. 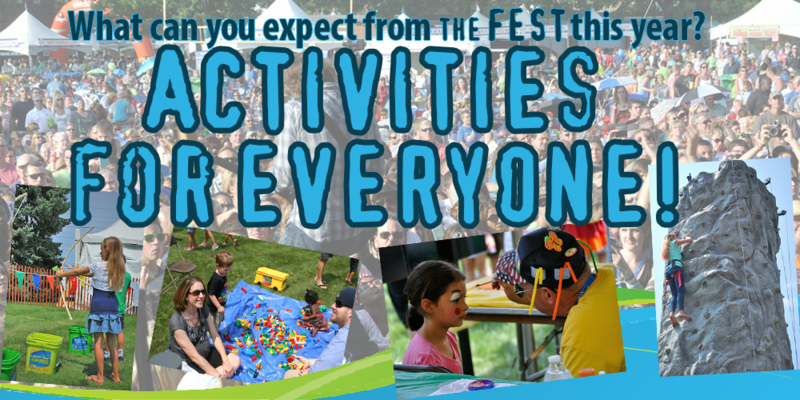 This is the 18th year of the FEST! We’re recycling past T-shirts into bags to carry all your FEST treasures! Make and use them at the FEST, then during the year to remember the memories you made at the FEST. 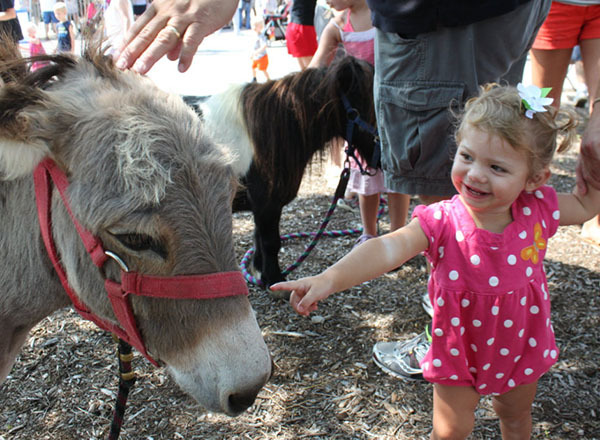 We have a new Petting Zoo with many more animals to see and explore. You’re never too old to feel the softness of God’s animals. Stop by the Girl Scouts Girls’ Religious Programs Tent. Look for ways to “Be the Light” in everything you do. Make a pair of binoculars to remind you to always be looking for ways to be the light for others. Always carry Jesus with you. Make a necklace to wear, place in your backpack, purse, or wherever you need to be reminded that Jesus is always watching over you. The Blessed Virgin is the light of our faith. Make a Marian pin. Remember to pray to the Blessed Virgin. Place the pin anywhere you will see each day. Use the beads to pray the Hail Mary, Our Lady’s prayer. God lights up my life! Come and make a light switch plate for your bedroom or anywhere else you need to remember that you are the most important person…you light up our world! Remember our military. Stop by and sign a card to send to our men and women serving our country. Take a few minutes to make a butterfly. When finished, take it home and share it with someone, a friend, neighbor, someone elderly or anyone who needs a symbol of how much you care for them. 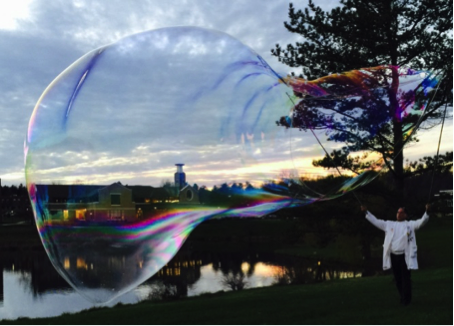 We welcome Bubbleologist and 2x Guinness Book of World Record Holder, Dr. Awesome back again by popular demand! Enjoy his expertise as you see a wall of bubbles, millions of bubbles and gigantic bubbles! You won’t want to miss a minute of this! Continue throughout the day and be sure try your hand and creating some fantastic bubbles! For more great pictures from Dr. 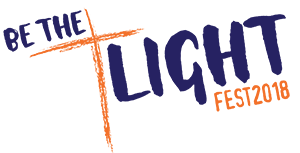 Awesome, visit www.drurawesome.com. We are pleased to welcome back the Wickliffe Percussion Group. You will hear them when they cadence down from Colby Park to the Kids Activity Area Blacktop to perform. It is always a thrill for the little ones when they get to be a drummer. Be sure to come by and support this award winning group. It’s always lively when the Murphy Irish Arts Center is involved. Dedicated to preserving Irish culture and the art of Irish Dance, you won’t want to miss these wonderful dancers. Bring the family and enjoy this world-renowned group. 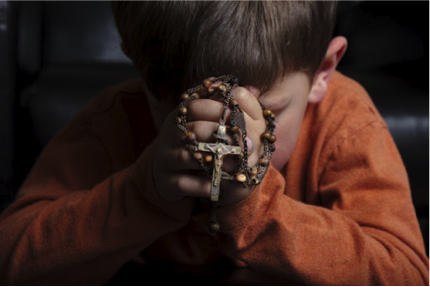 Children need a time to pray, too. Stop in the Kids Entertainment Tent on the half hour and learn a prayer..some you may know, some you may not. Each prayer will be given out as a prayer card so you can take home with you! Come every half hour and you will have 7 prayers for your child to have and pray! Located in the Brown Scapular tent, come and pray every quarter hour, 12:15, 1:15, etc. Sunflowers grow strong because of the sun’s light. Make a flower and add a prayer. Place it somewhere where you are able to pray it daily. Grow with Jesus. Welcome All Our Spanish Friends! Dios está con nosotros en cada persona. We will once again have a Spanish Area with our Spanish speaking friends! Come and learn about Sand and Sawdust Art from our friends at Sagrada Familia. Try it yourself! Pick up a Spanish prayer card. Have some fun with our Spanish friends from St. Mary’s in Painesville! You won’t be able to miss this GIANT wall! Stop by and make a lantern to hang on the wall. Put your family name and church name on them. Let’s see if we can get all the parishes in our 8 county diocese! While you are there, add a flower in memory of a deceased loved one who can’t be with you today, but you know is watching down and praying for you from above. We will be praying the rosary every hour on the hour. You are also welcome to come and pray the rosary any time in between on your own. The St. Justin Martyr rosary makers have been very busy making free rosaries to give away and will help you learn the rosary if you need to learn. All ages are welcome. Jesus is the light that guides our lives. Write your problems, prayers, worries on a piece of paper and “Give it to God”. These lanterns will be taken up at the Offertory during Mass. Families that pray together can bring change. In the Family Blessing tent, deacons from around the Cleveland Diocese will pray with you and for you. Sometimes the road can be uncertain for us or those we love. We trust in prayer. Be sure to take a prayer card with you that you can pray throughout the year. 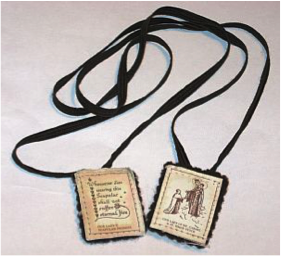 For over 700 years, the Brown Scapular of Our Lady of Mt. Carmel has been one of the most precious gifts and highly-indulgenced Sacramentals of our Church. It is more than that, however; it is in reality a garment, given to us by Our Blessed Mother which makes us her special children. Blessing and clothing with the Scapular of the ‘Blessed Virgin of Mt. Carmel’ enrolls the individual in the Scapular Confraternity and admits him to a share in all the spiritual works performed by the Religious of Mount Carmel. Scapulars will be provided free of charge if you wish to take part in this special blessing. There is also information for children about the Brown Scapular. A prayer labyrinth is a labyrinth used to facilitate prayer, meditation, spiritual transformation, and/or global unity. They have been around for centuries and are all around the world! Pick up a card that explains the 3 stages of the labyrinth. Come pray in our n the center of the labyrinth, write your prayer intentions. Twinkle, twinkle little star…let God’s light shine wherever you are. Our kids area for ages 1-8 is filled with stars! Hidden away in the tennis courts by the Mom’s relaxation station, make sure your little ones take time to visit!! Put on an apron and have fun with paint and write the names of those shining stars in your life! Show everyone at the FEST that you are a shining star! Make a headband and wear it at the FEST! Boys and Girls can all do magic! Make a star wand to bring light to everyone they see! Run, jump, crawl, walk, and have fun with our safe Obstacle course! Run through once, twice, as many times as you like! The Corn Sandbox is back! Have fun playing in the corn all day and at the end of the day we can recycle to feed the animals! To short to play basketball? Check out our kid friendly game. “I’m God’s Shining Star” , a great souvenir from the FEST…bring your phone or camera! As usual the big wheels, blocks, Lego’s and sidewalk chalk is there for the whole family!! “Thank you God, today’s a day I’m looking forward to. Help me, as I enjoy my day, to still remember you. I’ll be a quick reminder of the prayers that you’ve just said.